What is it with me and reading these days? I guess you could say that I'm probably going through a bit of a lull right now, seeing as it took me nearly three weeks to read Fear and Loathing in Las Vegas. You could also suppose that, because it took me so long, I didn't enjoy this book. Well, both of these assumptions are correct. I absolutely loved Thompson's novel, The Rum Diary (review here), so I really wanted to enjoy Fear and Loathing too. But unlike The Rum Diary, there are no surprisingly elegant descriptions. I also didn't connect at all with the characters, and their drugged-up antics became tedious by the end of the book (though they were amusing during the first fifty pages). I was very dissapointed. 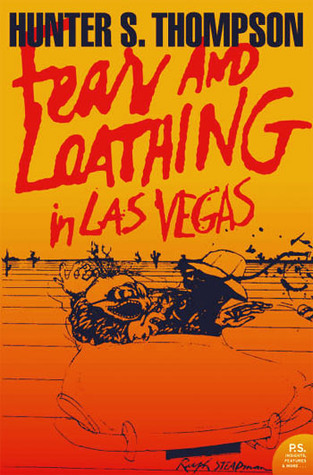 I know Fear and Loathing is Thompson's most celebrated novel, but I fail to see why. The Rum Diary, for a reader like me, just has so much more substance (no pun intended!) Perhaps it's the sheer, unbelieable obsurdity of Fear and Loathing that reels people in: its Gonzo style. Obviously, I just didn't get it. Have you read Fear and Loathing in Las Vegas? What were your thoughts?